He then accepted active duty orders aboard the Nimitz Class aircraft carrier, the USS George Washington, based out of Yokosuka, Japan. After two deployments, Dr. Witcher returned to San Diego, where he was stationed with the United States Marines at the Marine Corps Recruiting Depot. He completed his board certification at that point, becoming a Board Certified Oral & Maxillofacial Surgeon, and discharging from the Navy to pursue a career as a private practice oral surgeon. An active learner, Dr. Witcher makes a point of staying up to date on the latest dental and surgical techniques and technology. He is a Diplomate of the American Board of Oral & Maxillofacial Surgery, a Fellow of the American Association of Oral & Maxillofacial Surgeons, and a member of the California Association of Oral & Maxillofacial Surgeons, the American Dental Association, the California Dental Association, and the San Diego County Dental Society. In addition, Dr. Witcher enjoys giving back to those less fortunate, volunteering in surgical and dental missions to Fiji and Mexico, as well as participating in CDA Cares and the California Care Force. Recently, Dr. Witcher was elected to the Board of Directors for the San Diego Dental Health Foundation, where he is working with other leaders of the San Diego dental community to build a dental clinic in the Veteran’s Village of San Diego to provide free dental care to San Diego Vets in need. In addition, Dr. Witcher was also recently named an editor of the San Diego County Dental Society Newsletter, as well as a member of the editorial board of the California Association of Oral and Maxillofacial Surgeons. In his spare time, Dr. Witcher enjoys the outdoors, including running, hiking, biking, fishing, camping, and snowboarding. He especially likes hiking Cuyamaca Rancho State Park and getting Julian pies afterwards! An avid sports fan, you can catch him cheering on the USC Trojans and SDSU Aztecs on Saturdays and the San Diego Chargers on Sundays. Go Bolts!! 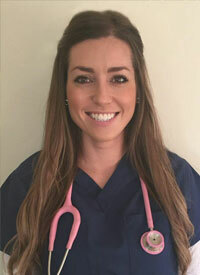 As a registered nurse, Jouet is enthusiastic about taking care of her patients and has experience doing so at several of San Diego’s large acute care hospitals. A graduate of Azusa Pacific University, Jouet is proud to have two Bachelor of Science degrees and is currently working towards her master’s degree. Jouet is skilled in perioperative nursing, post anesthesia recovery, and clinical management of complex medical cases. Her compassionate demeanor reflects her dedication to the nursing profession. As a San Diego native, Jouet knows all of the best spots to relax and explore around the county. In her spare time, Jouet enjoys spending time outdoors with her dog, Richard, hiking, biking, golfing, jeeping, traveling to new places, and cheering on her hometown team the Chargers! As a registered nurse Jouet is happy to answer questions and teach patients about the procedures at Coastal Oral and Facial Surgery.